Written by American Cooling And Heating on . Posted in Air Conditioning, Heating, Maintenance. There are many important reasons for having Heating and Air Conditioning System Maintenance performed. Heating and Air Conditioning Systems can fail due to a lack of maintenance and this typically happens when you need to depend on the system working. This can cause something as minor as inconvenience or can put people with health related problems at great risk. If your system is past its prime or even if it’s brand new take advantage of the energy efficiency gains made and avoid costs of premature failures by having maintenance performed annually. A licensed HVAC Contractor can visit your home and evaluate your Heating and Air Conditioning System and advise you of its condition. Written by American Cooling And Heating on . Posted in Air Conditioning, Heat Pumps. We provide Arizona with Service for Trane Heat Pump Package Units, Trane Heat Pump Split Systems, and all other types of Trane Cooling and Heating Systems. American Cooling And Heating has a fantastic reputation in the industry for providing high quality and expert HVAC Services throughout Arizona, our HVAC Techs are ready to provide you with the highest quality of Service, all Service trucks are over-stocked to get your Trane Air Conditioning or Heating System up and running asap. 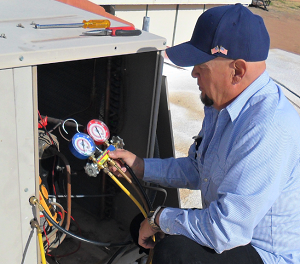 We provide professional quality Air Conditioning and Heating Equipment and Systems Repair Services and as one of the most honest Air Conditioning and Heating companies in Arizona you can be assured of competitive pricing as well as 100% guaranteed workmanship. We service all brands and types of Commercial and Residential HVAC systems and provide 24 Hour Emergency AC Service. Written by American Cooling And Heating on . Posted in AC Repair, AC Service, Air Conditioning. American Cooling And Heating has an excellent reputation for providing expert service for all Trane Air Conditioning products. We service Phoenix Arizona and all surrounding cities, towns, and areas. We provide and Service Trane Air Conditioning, Trane Heat Pumps, Trane Gas and Electric Furnaces, and we provide fast and efficient AC Service and AC Unit Replacement for all brands and types of HVAC equipment and systems throughout Phoenix Arizona and all surrounding areas. Emergency AC Service Technicians are on call to meet your needs. Written by American Cooling And Heating on . Posted in Cooling Tips, HVAC Sales. Replacement of your Air Conditioning or Heat Pump System can be a hard choice when the time arises . There are many factors to take into consideration when choosing a new system such as brand, efficiency, system types, ductwork, structural considerations, load calculations, and budget. American Cooling And Heating can help, we are knowledgeable in all aspects of Air Conditioning or Heat Pump installation and we provide free in home estimates on your schedule. We sell and service Carrier, Trane, Lennox, Goodman, Rheem, York and all other major brands, and we offer financing options O.A.C. Weekend or nighttime emergencies are no problem, our service crews are available to install your new system 24/7. Summer Is Here In AZ! Its A/C Time Again! Written by American Cooling And Heating on . Posted in Cooling Tips. The heat is on…. If you haven’t had Air Conditioning or Heat Pump system service yet this year then the time is now before the temperature increases. A system that is not maintained properly can lead to premature component failure and abnormal wear and tear. You need to depend upon your HVAC system when you need it, a failure due to lack of maintenance is costly and definitely not convenient. Contact us to set up maintenance for your Air Conditioning or Heat Pump system and get your system ready for the abuse that this summer will certainly dish out. A full system maintenance can help save your Air Conditioning or Heat Pump system from unnecessary failures.